Subject-centric | What if every subject that we think about can have explicit representations in our computers? If we were interested in simulating consciousness, what would we model? In the previous post we described the agent architecture of our interest. This post concentrates on capabilities supported by this architecture. We loosely follow the approach outlined in “Axioms and Tests for the Presence of Minimal Consciousness in Agents” , but instead of minimal set of axioms we develop a capability model to clarify directions of our research and implementation. In this post we concentrate on one of the building blocks – OODA loop capabilities. Simulating interaction between episodic and semantic memories is a great topic for the following posts. It is a good time for background processes such as memory optimization, learning, etc. This entry was posted in Thoughts and tagged Simulating consciousness on June 10, 2018 by Subject centric. The first wave of my interest in Artificial Intelligence (AI) was before “AI winter” (90s). As a researcher, I concentrated on knowledge representation and acquisition, active memory and behaviour modelling, knowledge-based machine learning, reasoning with defaults and contradictions, and general AI architecture which would allow to combine various modules into an “intelligent system” capable of demonstrating wide range of intelligent behaviours. Today it would be close to working on “Artificial General Intelligence” – AGI. Then “AI winter” happened (combined with many exciting developments in computing industry), and after many following winters, I found myself with more than 20 years of designing, building, managing… often quite sophisticated but not that intelligent computer systems, well… until recently with revived interest to AI and Machine Learning (ML). I had a chance to refresh Python skills, took contemporary AI, ML courses. Udacity, thank you for thoughtful and practical nano degrees and online courses!. Why? Because many fundamental ideas and promises from 50-90s can be finally implemented and there are so many new opportunities and problems to solve! After some reflection and thinking about Massively Transformative Purpose (MTP)  … for me it is about finding architectures and building intelligent systems with simulated consciousness. We have explicit separation between the environment and the agent. For agents with physical embodiment, this separation comes naturally. For software agents, it takes a discipline to model sensors, sensing, acting, and actuators explicitly. The agent uses its sensors to get raw representation of the environment based on sensor capabilities. This raw representation is interpreted and transformed into an internal state combined with the representation of the agent itself. These representations contribute to evaluation of the current situation and selection of the appropriate actions which is mediated by forecasting, planning, goal management, motivation, emotions and ethics subsystems. Some of the actions are targeted at the environment and some at changing internal states of the agent. I am specifically interested in agents with multiple skills, capable of working in various domains. This concern is addressed by Expert Agents. They encode knowledge required for some specific domains such as playing chess, solving math puzzles, ordering pizza or supporting “chit chat”. These experts are integrated into the main “observe-orient-decide-act”  loop and typically have specialized representations of the environment and domain of their expertise. Expert Agents are active, often run background tasks and compete for “attention”,”focus” specifically when several agents require access to the same unique resource such as communication channel. The main agent architecture is extendable: it supports new/evolving Expert Agents. Everything described before follows “competence without comprehension” meme (I highly appreciate Daniel Dennett’s perspective on the nature and evolution of consciousness). Systems with the outlined architecture can demonstrate sophisticated and intelligent behaviours, including being reactive, establish, follow, change, postpone and revive goals, shift focus, predict situations and results of actions, impact on environment and the agent itself. It includes also basic self-model which mediates selection of actions. Important component of the proposed architecture is the Reflection Subsystem. Is it a module responsible for “Cartesian Theatre” ? Not really. Heavy lifting of intelligent behaviours – competence – is implemented by other components. The Reflection Subsystem implements more advanced agent self-model and has capabilities to influence work of other modules: it is an additional layer of behaviour mediation and control. Fantastic topic for next posts! This entry was posted in Thoughts and tagged Simulating consciousness on April 22, 2018 by Subject centric. Traditionally the term Intelligent Personal Assistant is associated with Siri, Google Now or Cortana and voice based communication. For me, this term means something different – extendable open modular platform doing useful things for the user with user privacy at the centre. I have been experimenting with various ways to build something like this for the last few years in my spare time. 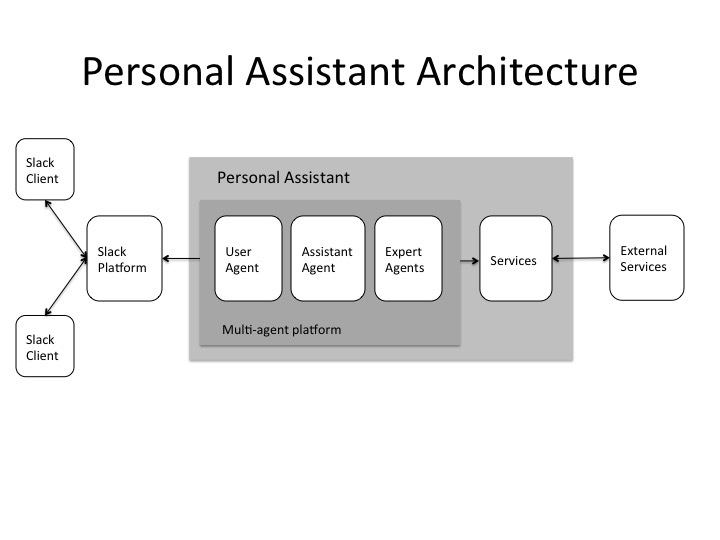 I consider it as a research hobby, although I would love to see some Personal Assistant Platforms in existence and usage. In this post I would like share some ideas and observations. My approach is more close to the approach used in platforms which became quite popular in resent years because of the ChatOps movement. The idea is to use chat-based user interface and “bots” which listen for patterns and commands in chat rooms and react on messages using coded “skills”. ChatOps solutions typically concentrate on coordination of human activities and task automation with bots. The same ideas (and software) can be used for building Personal Assistants. I have been interested in exploring core assistant architecture so I decided (after trying few different bot frameworks) to use JASON . JASON is not a typical bot platform, it is a framework for building multi-agent systems. JASON is written in Java but agent behaviours and declarative knowledge are coded in AgentSpeak  – high level language with some similarity to Prolog. Current architecture is presented below. I use Slack as a chat platform. Slack provides user apps for various devices, it allows messages with rich content and has APIs for bot integration. There are couple variations of API, but the most attractive from the Personal Assistant perspective is the WebSocket based Realtime API. With this API, bot (assistant) can run in a cloud, on an appliance at your home, or just on your desktop computer (if you still have one). Slack group capabilities are also helpful, it is possible to communicate with various versions and types of the assistants. I use node.js-based gateway to decouple Slack and JASON based infrastructure. I also use Redis as a simple messaging medium. There is nothing special about node.js and Redis in this architecture except that both are easy to work with for implementing “plumbing”. JASON AgentSpeak does not have capabilities to talk to external services directly but it can be extended through Java components. I coded basic integration with Redis pubsub inside of my JASON solution, and for advanced scenarios (when I need services with lots of plumbing) I use node.js or other service frameworks. Personal Assistant is implemented as a multi-agent system with additional components in node.js (and other frameworks as needed) communicating through Redis. At the centre of the multi-agent system is the Assistant Agent, User Agent and various Expert agents. User Agent is responsible for communicating with the user, Assistant agent plays the role of the coordinator and Expert agents implement specific skills. Expert agents can delegate low level “plumbing” details to services. The system is quite concurrent and runs well on multicore computers. JASON allows also to run multi-agent system on several computers but this is outside of my current experiments. Agents can create other agents, can use direct message based communication (sync and async) or pubsub based message broadcasting. Agents have local storage implemented as prolog-like associative term memory, logical rules and scripts. AgentSpeak follows BDI (Belief–Desire–Intention) software model which allows to code quite sophisticated behaviours in a compact way. Prior to JASON I tried to implement the same agents with traditional software stacks such as node.js, Akka Actors. I also looked quickly at Elixir, Azure Actors. It is all good, it just takes more time and lines of code to get to the essence of interesting behaviours. I actually tried JASON earlier but made a mistake. I started with implementing Personal Assistant as a “very smart” singleton agent. Bad idea! Currently JASON-based assistant is a multi-agent system with many very specialized “experts”. Let’s look at the “Greeting” expert agent, for example. This agent can send variations of the “Hi” message to the user and will wait for greeting response (for some time). The same agent listens for variations of the “Hi” message from the user. Greeting agent implements bi-directional communication with the user with mixed initiative. It means that the agent can initiate greeting and wait for the user response or it can respond to the user greeting. In addition, greeting agent reacts on user on-line presence change, remembers last greeting exchange. After successful greeting exchange it broadcasts “successful greeting” message which can initiate additional micro conversations. 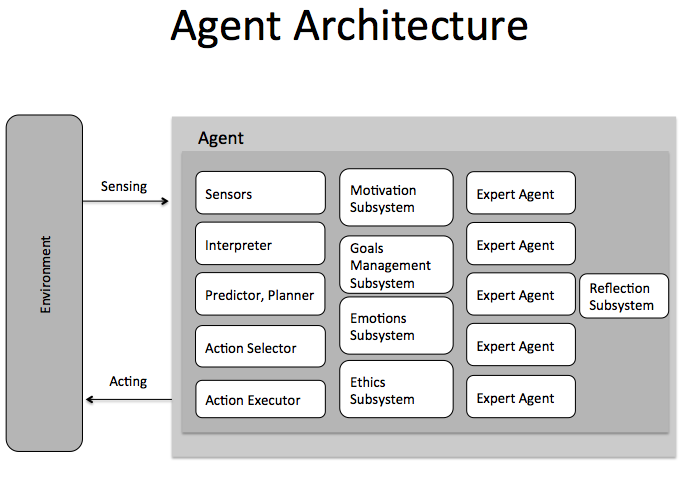 Reactivity, autonomy, and expertise are the primary properties of the Assistant multi-agent system. Various expert agents run in parallel, they have goals, react on events, develop and execute plans, notify other agents about events, compete for the user attention. Although many agents run simultaneously, there is a concept of the “focus agent” that drives communication with the user. Even without requests from the user, Assistant is active, it may generate notifications to the user, ask questions, suggest to initiate or continue micro conversations. Multi-agent platform JASON directly supports implementation of manually encoded reactive and goal oriented behaviours (quite sophisticated). It can be also extended with more advanced approaches such as machine learning, simulation of emotions, ethical decision making, self modelling. My current interest is mostly in experimenting with various expert agents, coordination of activities and user experience, but I am looking forward to other topics. This entry was posted in Thoughts and tagged Actor model, Intelligent Personal Assistant, subject-centric on October 27, 2015 by Subject centric. Home automation became a hot topic again. We have more sensors, automation devices, more connectivity options, and better managing apps. Legacy approach to home automation typically includes using several mobile controlling apps each dedicated to a specific device. This approach is not sustainable with the increasing number of devices. It does not provide optimal user experience: we cannot see the “big picture” – status of a “home” at any moment of time. We are forced to jump between various controlling apps with different user interfaces. There is no simple way to see correlation between device performance. Optimization, predictive modelling are limited by device scope. More advanced approach includes the idea of a “home automation hub”. In this case, user can have only one app which controls all home automation devices. Hub unifies various physical connectivity protocols, creates integrated “big picture”, allows advanced optimization. Many consumers will be probably quite happy with this level of automation and integration (at least for now). As the natural next step, I see potential for integration of “home automation hub” into Intelligent Personal Assistants. “Home” is an important concern for many, but not the only one. The same type of consolidation is going on in other areas. We may soon deal with “personal health hub”, “personal finance hub”, “personal investment hub”, “car hub”, “transportation hub”, “travel hub” etc. Each of these hubs will be active, monitoring current situation, identifying possible/recommended actions, “fighting” for our attention. Some mediation will be required and this is one of the main roles that can be played by Intelligent Personal Assistants: optimization of user experience based on integrated view of highly automated world. This entry was posted in Thoughts and tagged Home Automation, Intelligent Personal Assistant on May 28, 2014 by Subject centric. I have been investigating Google Glass Mirror API and this investigation has generated some thoughts about Google Glass and Personal Intelligent Assistants that I would like to discuss. I am quite enthusiastic about Google Glass, mostly because it creates a framework for context-aware real-time user centric services. 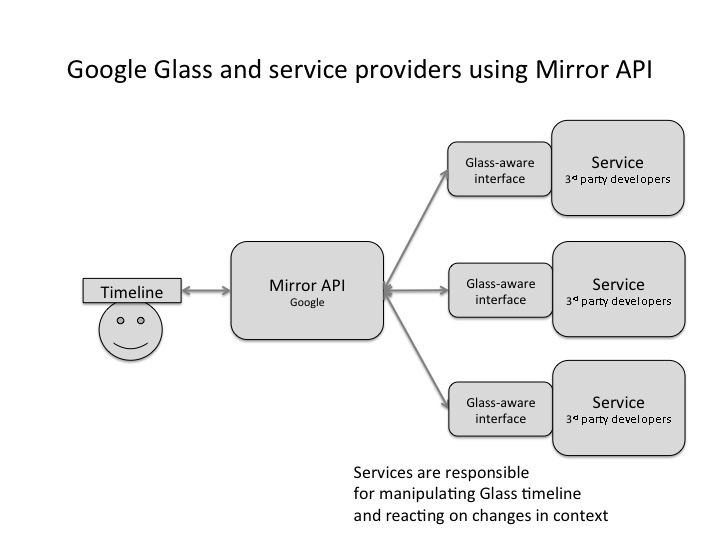 I am very interested in the Mirror API service created and maintained by Google and capabilities for developers to deliver services based on the Glass platform. How can we incorporate Intelligent Personal Assistants into this picture? 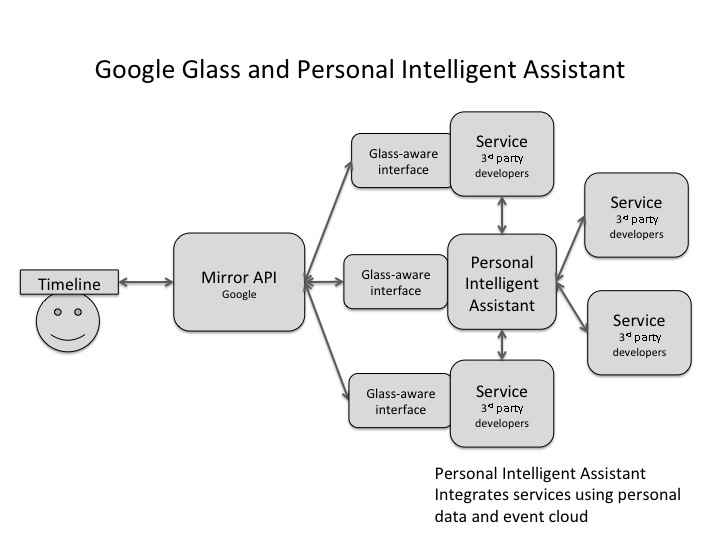 Personal Assistant can be viewed as a specialized service with one of its interfaces being Glass-aware. Intelligent Personal Assistant provides mediated communication between its owner and various service providers. It manages personal data/event clouds and provides integrated view on “things” and events important for its user. Personal Assistants will have multiple user interfaces including smart glasses, watches, phones, tablets, car dashboards, TVs, etc. This entry was posted in Thoughts and tagged Google Glass, Intelligent Personal Assistant on April 27, 2014 by Subject centric.